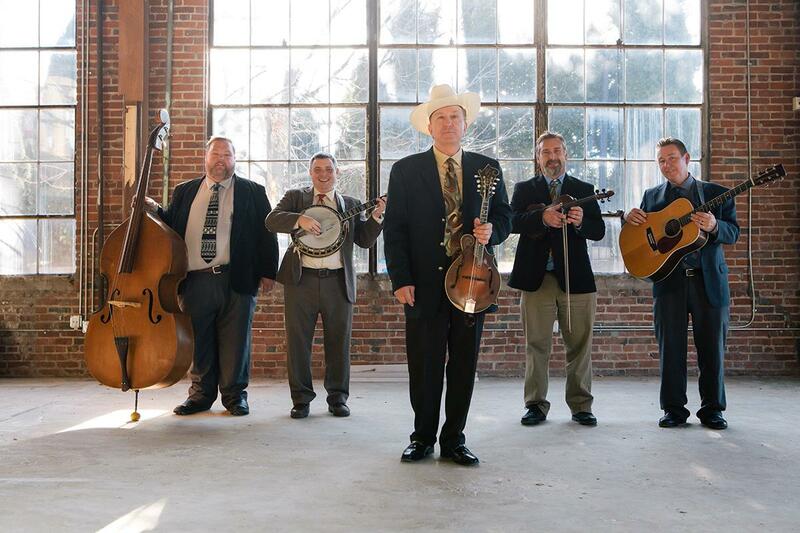 David Davis and the Warrior River Boys will perform a concert of bluegrass music Monday, April 22, at 7:00 p.m. at the Collins Theatre, 120 West Emerson Street, in downtown Paragould, Arkansas. The show is part of the Bluegrass Monday concert series presented by KASU 91.9 FM. There is no admission fee, but KASU will literally “pass the hat” to collect money to pay the musicians. The suggested donation is $5 per person. From Alabama, David Davis is continuing a family tradition of singing and playing bluegrass music. In the 1930s, his father and two uncles played and sang in the style of “brother duets,” a forerunner of bluegrass music as it is known today. Following World War Two, David’s Uncle Cleo was in the first incarnation of the Bluegrass Boys, the backing band for Bill Monroe, the man who invented the sound of bluegrass music. Leading the Warrior River Boys since 1984, David Davis has recorded CDs for the acclaimed Rebel record label, and the group currently records for the prestigious Rounder record label, one of the top producers of recorded bluegrass music. In 2010, Davis was inducted into the Alabama Bluegrass Hall of Fame, and in 2014 he was induced into America’s Old-Time Country Music Hall of Fame. Davis sings and plays mandolin for the band. His mandolin style is highly influenced by Bill Monroe’s music. The Warrior River Boys includes Robert Montgomery on vocals and banjo. A member of the band since 2008, Montgomery has won dozens of bluegrass-picking contests, most noteworthy the 2004 National Old-Time Banjo Championship at Uncle Dave Macon Days in Murfreesboro, Tennessee. He was featured on the Cumberland Highlanders TV program on RFD-TV, and he has appeared as a guest musician on CDs by Marty Stuart and Bobby Osborne. Guitarist and vocalist Stan Wilemon has had a long relationship with Davis and the band. He was in the group in the early 1990s, and later he performed with the Gary Waldrep Band before rejoining the Warrior River Boys. Wilemon is an acclaimed bluegrass songwriter, and many groups, including the Warrior River Boys, have recorded his compositions. Additional information about the Davis and the Warrior River Boys is available at www.daviddavisandwrb.com. Seating at the concert is first-come, first-served. Doors to the theatre will open at 6:00. KASU, 91.9 FM, is the 100,000 watt public broadcasting service of Arkansas State University in Jonesboro. For more information, contact KASU Program Director Marty Scarbrough at mscarbro@astate.edu or 870-972-2367. Bluegrass Monday is also on Facebook (search “Bluegrass Monday”).